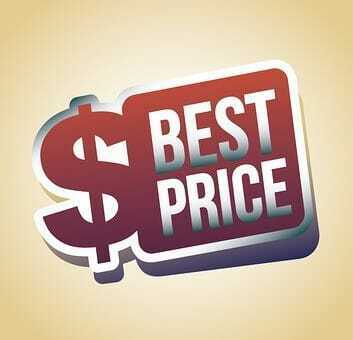 The display of prices for products and services is a long-standing debate. Should you show them? Should you hide them? What colour should prices be displayed in? How big and what kind of type should you use? Gosh – there are so many questions for just one element of online marketing. Research shows mixed results. People respond to pricing displays in different ways depending upon their own motivation, the trust they have in the business, their loyalty to the company and a host of other reasons. However, one consistent finding is that shoppers tend to trade functionality for convenience when buying something. If they want something now, rather than wait to find the right item. they tend to accept lower functionality. For instance, if you needed a new mobile phone now, you’d buy what you could get – even if it didn’t have everything on it you really wanted – and not wait a week to get the “right one”. Similarly, if you find yourself stranded in a town and you need a hotel, you opt for the most convenient even if you’d really prefer to roam around until you found one with that spa and swimming pool your really wanted. In many instances convenience trumps requirements. Interestingly, though, price appears to come into play in our decision-making in terms of convenience or functionality. And new research suggests that we behave in the opposite way to what many marketers think. For the “buy it now” kind of shopper marketers seem to think we are influenced by price. Hence for many “low-end”, “get it now” kind of online stores you see the prices blazoned across the sales page. It is supposedly emphasising the value of the item. We are meant to think, “goodness me, that’s cheap, I must get it now”. However, this research suggests we think in the opposite way. When those higher function items on sale have their prices displayed and we are constantly reminded of the price we tend to be more ready to wait to buy them. In other words, price displays seem to favour longer-term buying decisions, rather than the short-term “buy it now” culture. The study also found that even if prices were not displayed, but that people were merely reminded of money by counting dollar bills before visiting the website, the long-term, higher functionality items were preferable. This suggests that if your products or services are the ones that need more consideration that are more aspirational and are not the kind of thing that people need “right now” then you will do better if you DO display prices. Whereas if you are selling items to appeal to the “I need it now” consumer, then the price display doesn’t make much difference, indeed you might make more sales without it. In essence, this study shows that if you display prices you encourage shoppers to desire functionality over convenience, working in your favour and against their usual instincts.